As you may have noticed from my lack of blogs lately, I’ve been otherwise occupied. After 8 months of a slow and boring schedule at work I have now had 6 weeks straight of assignments – four weeks of which I was away in hotels and two of which I’ve been in charge of. And all the while I’m stressing over trying to find a new place to live, the knowledge of having to pack up this place soon, and a slight quarter life crisis regarding my career and future plans. So on this seemingly regular Thursday night, as I prepare myself for an early morning commute into the construction and traffic ridden depths of downtown Toronto to begin another assignment, I unwind. I may have many different ways to unwind (such as lavender pillow mist, bubble baths and demanded back rubs), but this one is for the special occasions – the NEED to relax moments. It’s my Fauchon Tea. Discovered in Paris when I was 17, this Tea is heaven. It’s Fauchon’s own signature blend of Ceylon, Black Tea, Rose Petals, Citrus and Lavender – decaf of course, it’s almost bedtime. You can see now why this is for special occasions only. This tin needs to last me till my next trip to Paris (in the near future hopefully). I’ve never fallen in love with a tea as I have with this and as sparingly as I use it I’ve gone through many a tin. It’s been my warm and fuzzy friend for 6 years now. So with my stress gradually unwinding, and my breathing returning to normal I just thought to share it with you. Cause if I’m not using this little space I call a blog to share little moments like this, than whats it for anyways? 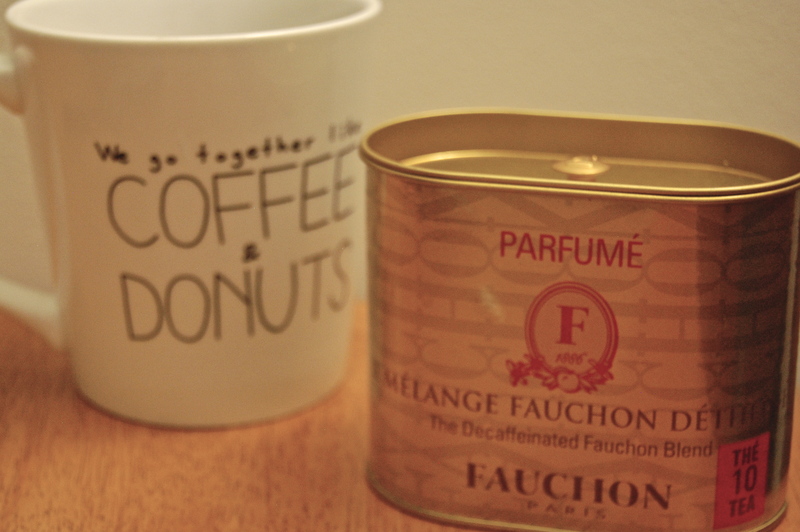 Have you ever tried Fauchon tea? Do you have something like this that calms you even at your most tightly wound moments?